A Business Model Canvas is a strategic management template that is widely used for developing new or documenting existing business models through a visual language. It is designed to portray the alignment of business activities that produce value by illustrating potential trade-offs. modelH is a business model canvas designed specifically for healthcare. The modelH canvas creates a common language for describing, visualizing, assessing and changing the key elements of every healthcare business model. It is complex enough to evaluate an entire business model, but simple enough for all parts of the paradigm to be understood. Expanding on Alex Osterwalder’s original 9 building blocks, modelH integrates aspects of Michael Porter’s definition of shared value and Clayton Christianson’s concept of “jobs-to-be-done”. It measures the value of a business model in its feasibility to deliver value, as well as its ability to deliver on the patient health outcome achieved per healthcare dollar spent. 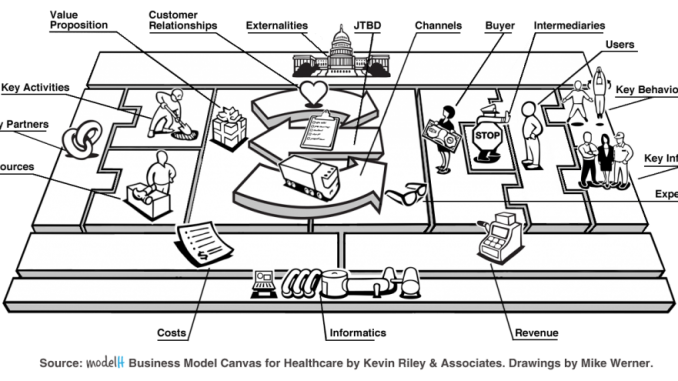 modelH is the open-source business model canvas that applies specifically to healthcare. It is also a community of healthcare and business model experts that are working together to change the system. Evaluation of each building block in a business model promotes consideration of the model’s strengths and weaknesses. Likewise, the structured layout of the canvas encourages thoughtful reflection regarding how the individual building blocks fit together. As a strategic management tool, modelH can be utilized to design, describe, challenge, invent, and pivot your healthcare business model. The 17 building blocks in modelH deal with 4 key business functions. The modelH canvas is comprised of 17 key building blocks. Users are the customers that a business model serves. Buyers are the customers a business model sells to & may also be the User. Intermediaries affect how a Value Proposition is seen and paid for by the Buyer. Jobs-to-be-Done (JTBD) are high-level goals the customer is trying to accomplish. Value Propositions are products & services offered to customers to solve their JTBD. Key Behaviors are the activities required of the User to complete their JTBD. Key Influencers affect the User’s understanding & ability to complete of their JTBD. Channels are the way a company brings its Value Proposition to market. Customer Relationships are connections a company creates with their Buyers & Users. Experience is how Buyers and Users perceive Channels and Customer Relationships. Key Activities are the most important tasks required to create the Value Proposition. Key Resources are the internal actors required to deliver the Value Proposition. Key Partners are the external actors required to deliver the Value Proposition. Costs are the most important financial drivers of a business model. Revenue is the way a company makes money from its customers. Informatics is the data and analytics needed to deliver and measure the Value Proposition. Externalities are the external forces & regulations imposed upon a business model. modelH was developed by Kevin Riley & Associates for www.modelH.org This work is licensed under the Creative Commons Attribution-Share Alike 3.0 Unported License. To view a copy of this license, visit http://creativecommons.org/licenses/by-sa/3.0/. The following resources are available for download and use.